If your nonprofit’s plan for online outreach includes a discussion forum – this one's for you. 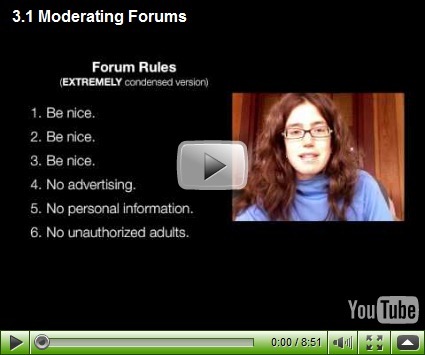 The first of three training videos produced to guide the volunteer moderators who helped run the British Columbia Library Association's 2009 Teen Reading Club, Moderating Forums is jam-packed with down-to-earth advice and guidelines for creating, nurturing and moderating a successful online community. Whether you’re new to forum moderation or an old hand at it, this video is 8:51 minutes well invested.